← Kieran Tapsell: The Seventh Pope to Require the Cover up of Child Sexual Abuse? Prime Minister Tony Abbott has declared the Medicare co-payment proposals “dead, buried and cremated”, but two related ideas behind it live on: Medicare is becoming “unaffordable” and our universal health system should morph into a program reserved for the poor. The government’s original justification for the co-payment was to bring more “price signals” into Medicare. In itself the idea has merit, but the government has been going about it in a ham-fisted way. Whether by design or accident, the government seems to be undermining the principle of Medicare as a universal tax-funded program, paving the way for private health insurance toplay a role in funding primary care. But private insurance, by its very nature, suppresses price signals and encourages over-servicing and cost escalation. It is an expensive way to fund health care. If the government wants more price signals in health care, it can start by standardising the mess of arbitrary co-payments in health care. If those co-payments can be re-designed to carry meaningful price signals, they will guide wise choice and contribute to efficient resource allocation. The government should also consider requiring those better-off Australians, who have much more liquid savings than in times past, to contribute more to their own health care from their own pockets rather than assuming that someone else – Medicare or private insurance — will cover the minor outlays they could easily afford themselves. It’s easy to panic about the looming cost of health care as Australia ages. That has been the message of successive Intergenerational Reports, the latest of which suggests that under “previous policy” (Labor government) setting, Commonwealth health expenditure would rise from 4.4% to 7.1% of GDP by 2054, but would be contained to 5.7% of GDP under the government’s “proposed policy”. The sensible response to these projections is to ask “so what?”. As the population ages, Australians will indeed spend more on health care. But simply shifting costs off-budget and on to individuals, or to private insurance mechanisms is an expensive and clumsy way to fund health care. It does not make health care more “affordable” – we still have to pay for it. As John Deeble, one of Medicare’s original designers, pointed out, the simple solution to fiscal pressures on the Commonwealth’s health budget is to raise the Medicare Levy. The government said that imposing a co-payment and reducing bulk-billing would result in reduced use of Medicare services, which have risen from 11 to 15 a head over the last ten years. That idea would be sound if Medicare services were stand-alone, but any reduction in demand would most probably be among those in most need of care, particularly early intervention to stave off costly episodes of hospitalisation and chronic disease. And there would be a shift of demand on to hospital emergency services. The costs to health budgets and to the whole economy (in terms of lost workforce participation resulting from chronic illness), could well be far greater than any saving in Medicare. But, as the Public Service Commission’s capability review of the health department points out, the department tends to work in “silos”, and seems to lack the capability of considering “whole-of-health-system policy”. Under pressure to cut expenditure, Medicare is the easy target. Costs outside the “Medicare” silo are not their concern, and if they can move some load on to individuals, private insurers or state government hospitals, that’s clever cost-shifting. That’s not so much a “policy”, which would be concerned with the public interest, as an attempt to contain outlays within an arbitrary fiscal limit. The specific co-payment idea came from the government’s Commission of Audit, which saw it as a first step in a stealthy but radical transformation of health services away from universalism, towards a US-style system with “an expanded role for private insurance” to “cover all services covered by Medicare and public hospitals”. Medicare would be reduced to a service for the “indigent” (to use the US term). Despite dumping the co-payment, health minister Sussan Ley still wants to “reduce the number of bulk billed consultations to people who can afford to pay something”. This suggests she sees Medicare as a charity or distributive welfare system, not a universal system as it was originally envisaged. As the freeze on Medicare reimbursements bites harder, bulk-billing will probably fall (as intended), resulting in mounting pressure on the government to change the legislation and permit private health insurance to cover the gap. The Commission hypocritically calls for people with means to take “individual responsibility for their health care”, but to be guided by “price signals” while they are herded into private health insurance. But private insurance is no more about “individual responsibility” than Medicare is: it’s still about handing over responsibility to a third party. Far from incorporating “price signals”, it simply changes the message from “Medicare will pay for it” to “HCF/BUPA/Medibank Private will pay for it”. This incentive for over-use is known as “moral hazard”. It’s easy to forget that we already have co-payments in health care. Out-of-pocket expenses, not covered by public or private insurance, account for 18% of health care expenditure, in line with other prosperous countries. But the breakdown of out-of-pocket expenses is messy and haphazard; a reflection of the “silo” arrangements in the health department. 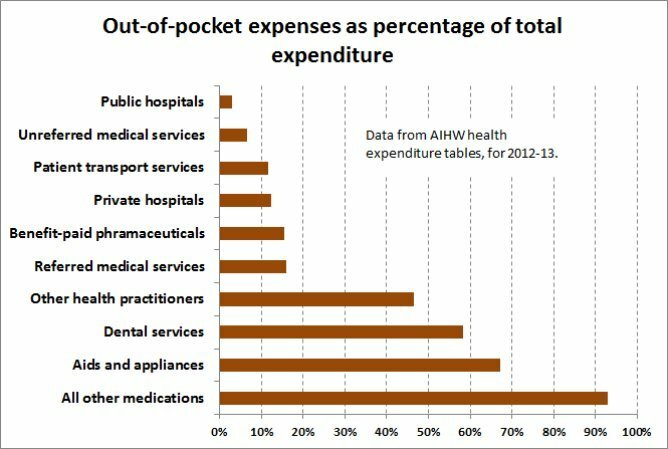 Expenses fall heavily on dentistry, specialist services and non-prescription medications. Many are uncapped, meaning the consumer is left bearing open-ended risk. It’s also easy to forget that Australians, on average, have enough liquidity to cope with modest co-payments when a need arises. Australian Bureau of Statistics data show that on average, households have A$37,000 in available funds. If we want price signals in health care, then there is a good case for requiring personal payments for those with means, without the moral hazard of third party payment. Some commentators suggest we should go down the path of health savings accounts, whereby people are required to set aside funds in personal accounts to be drawn on only for health care needs. Only when a person’s health savings account is depleted does the state cover additional expenses. Health savings accounts certainly have advantages over private insurance, in that they retain a measure of individual responsibility, and they tend to accumulate with age. But they have their own problems, in that when someone’s HSA reaches a high level there is a “use it or lose it” form of moral hazard. And in economic terms, they tend to privilege health spending over other consumption, thus distorting consumer choice. In any event, Australia’s compulsory superannuation is already serving some of the same purpose as health savings accounts. Once Australians retire, their superannuation balances become accessible as personal accounts (apart from those whose superannuation is in annuity form). Including superannuation, singles over 65 have on average A$170,000 in reasonably liquid assets, while couples have A$430,000. We could be served well by a requirement that all with means pay for their health care up to a limit before Medicare kicks in to cover high costs. That’s essentially the policy the Coalition took to the 1987 election, when it proposed that all who could afford it should contribute the first A$250 a year to their health costs (equivalent to about A$800 now), without the support of insurance. That would mean most people make no call on public funds in any one year, while preserving the universality of Medicare as a single national insurer, covering those with high needs or limited means. That’s essentially the Nordic model. It combines the best or market price signals and the power of a government insurer, without the distortion and high cost of private health insurance or fiddly and paternalistic measures such as health savings accounts. Ian McAuley is Lecturer, Public Sector Finance at University of Canberra. This article was first published in The Conversation on 1 April 2015. This entry was posted in Economy, Health, Politics and tagged health-co-payments, Ian McAuley, Medicare levy, Out-of-pocket health costs, private health insurance, The Conversation. Bookmark the permalink. One Response to Ian McAuley. If the government wants price signals, it should stop supporting health insurance. Just because Dr McAuley is a lecturer in Public finance does not make him an expert in social policy. For that reason his “ex cathedra” statement that Medicare should be reserved for the poor should be disregarded as opinion without evidence. If “price signals” are a good thing, then let him argue it and then see how his argument stands up against education, for example. Furthermore, he needs to present data — which, of course, he does not, which might show that Australians are utilising medical services excessively. My understanding is that we do so at very comparable rates to countries with which we have social and economic parity. The current government wants “price signals” solely for ideological reasons (though they don’t want the “principle” to apply to superannuation, for example). There are several social arguments in favour of “bulk-billing” and if costs “appear” to be outpacing then income, then there are two answers. Increase the levy (that is highly affordable: Australians pay quite small amounts of taxation in comparison with other economically-developed countries (compare Germany, for instance). The other issue (especially when people say that medicine costs too much) is to look at how much money is saved for the community by modern procedures and medication: people are back in the workforce sooner, their health is generally better (with, for example better blood-pressure and diabetes management or better treatment of sundry malignancies). Those savings and contributions to productivity need to be factored into any assertions about medical costs. Furthermore, quicker patient turn-arounds mean that hospitals are far more efficiently utilised than, say, 30-40 years ago. It is also true that many procedural specialists in private practice charge excessive fees: the more public medicine that we have, the better we’d all be.